GE Renewable Energy announced today that it has signed a Memorandum Of Understanding with Eolien Maritime France (EMF) confirming its commitment to provide and service Haliade 150-6MW turbines to the first French EMF offshore wind farm to be cleared of any legal recourse. This memorandum of understanding terminates GE’s exclusive supplier status on the two other projects carried out by EMF. The terms of the Memorandum of Understanding have not been made public. Currently, the three projects developed by EMF off Courseulles-sur-Mer, Saint-Nazaire and Fécamp are still awaiting the last court decisions, following appeals against the administrative authorizations required for their implementation. The cumulative excessive delays since 2012 on these projects, related to these claims, have significantly impacted the financial characteristics of those projects for GE Renewable Energy. GE has therefore decided to review its engagement in the implementation of all these projects. Since the award of the three offshore wind farms to EMF in 2012, GE Renewable Energy has committed the necessary resources and investments to design and manufacture the turbines, with the installation of a dedicated engineering office in Nantes and the construction of its manufacturing plant in Saint-Nazaire, which has enabled GE to produce already more than 80 turbines for other offshore wind farms in Europe, Asia and North America. 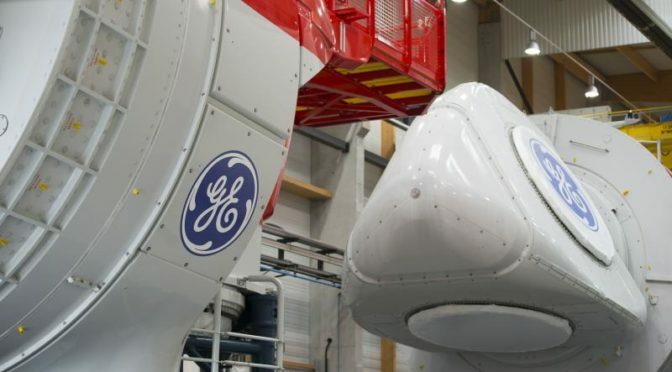 In a technological and market that has changed significantly in recent years, GE has chosen , while executing when time comes the remaining EMF project, to continue its contribution to the development of the offshore wind energy sector in France through an ambitious evolution towards a new generation of Haliade-X 12MW turbines. Resources from Saint-Nazaire, Nantes and Cherbourg will be mobilized in order to ensure the development and commercialization, then the delivery, of this new turbine. GE is a leading player in the French renewable energy sector, fully committed to its development.